missional | In the Key of "H"
When I lived in West Virginia, the only major weather incidents we had to live through were a few power outages and some really cold temps from time to time (Dec-March!). Recently, my WV friends and church family had the opportunity to experience life without clean water due to a chemical spill. After days of only using water for toilets, the “licorice” smell seems gone and water back to potable levels. Allegedly. It might take a little while before I trusted that declaration. What an opportunity to simply invite people in and serve them? No strings attached, just meeting needs in the community. Very cool. But the church also has living water, of which people also need to come and drink regardless of whether that need is expressed in the same physical way (feeling of thirst and really bad b.o. when can’t bathe). I think the same type of mentality should actually be present in thinking about this living water, which is one way Jesus describes himself and what he offers us (John 4). Christians are not better people, simply people who have realized their need and found that need met by Jesus Himself. Of course belief is perpetual and Christians have to continually come back to Christ in repentance and faith. We have found a place where there is water without cost. There is a safe harbor, a community welcoming other thirsty people who have decided to stop one-upping themselves before God and others, and have instead drunk deeply of the head waters of grace. I realize many folks reject Christianity because they don’t like the idea of someone being Lord of their lives, or they can’t get around a guy raising from the dead, or even because they think that it is narrow. But I think many still reject a taste of what they think the gospel is. The Christian cannot think of himself as better than another, primarily because he isn’t. If he or she can adopt the posture like this West Virginia church and say, “We have water here. Would you like to come and taste it?” I think a number of skeptics might be willing to at least give it a taste. The church as it gathers should obviously be such a place. But the church as it scatters (individuals and families showing and sharing the love of Christ), should also reflect the corporate ethos. And I’m from afar West Virginians open up their homes, inviting all who in need (even friends of friends) to take clean showers and fill up their water jugs. That’s the kind of church many people want to either connect to or investigate. And that’s the kind which reflects its author Jesus. Upon meeting a skeptical man named Nethaniel who questioned whether anything good could come from Jesus’ hometown, he not only didn’t reject him but welcomed him, “Behold, an Israelite indeed, in whom there is no deceit!” (John 1:47). But before he met Jesus, his friend simply invited him to “come and see.” In other words, I met him, and why don’t you come and see if Jesus is who He says He is? After having been slightly let down by the first few episodes of Arrested Development, Amy and I were in the “market” for a new show. 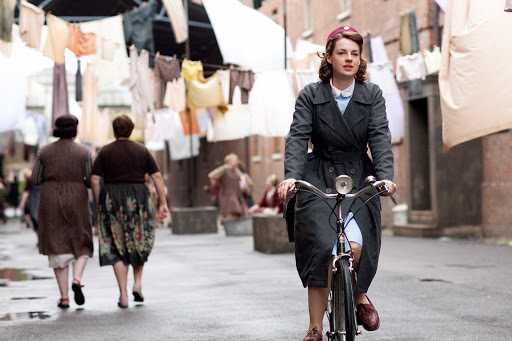 Since we’ve always been interested in midwifery, particularly during the 1950’s in England, we thought Call the Midwife would be a perfect fit. Obviously I joke, but I was in fact the one who questioned why there were no male duolas (I called them dude-las) in the field while going through our first birthing classes. Strangely enough the question wasn’t taken too seriously. We’re only one episode into the series, but I was impressed from the start. It depicted a privileged and unsuspecting midwife graduate taking her first job in a rough section of England. And to her surprise, and dismay, she gets saddled with a bunch of nuns. Nothing against nuns, of course. The main character is blown away by the rough conditions in the apartments, particularly after one of her patients has a huge syphyllus sore that she just “hadn’t gotten around” to checking out. What a beautiful scene! What is a local church to do with the sin, shame, and at times syphyllus in its surroundings? Should we be surprised? Should we bring more shame upon shame by distant judgments and telling people to simply change? Should we vacate the area and head for “higher” ground? Since we are all sinners, we certainly have common ground with non-Christians. Lots of it. I sure do. And my theology reminds me that I shouldn’t be surprised at any condition people live in; should I expect people who have not tasted the gospel to live as though they have tasted grace (regularly repenting from sin/self righteousness and resting in Christ’s performance for and approval of me)? Now “living like this” may look like gross personal sin: syphyllus and shancre sores. Or it may look like poverty, crime, disease, and other affects compounded by personal and communal sin. Or it may look like good old-fashioned self-righteousness, self-sufficiency, and idolatry. Regardless, people everywhere, all over, “do live like that” and are in great need of the gospel (as are Christians too by the way-so we have that in common as well!). Instead of running from them, a church and its people have an opportunity to run toward them. Shouldn’t we say, “That is why we are here?” That is why our church plant is here. “Living like this” is a result of disbelieving the gospel, and doesn’t that give us and others hope? Our answer to the surrounding world isn’t “live like us” or “live like Jesus” but turn and rest in Jesus. I suspect that many people who have rejected Christianity as a whole, reject moralism or self-helpism without really understanding the actual gospel message. Why is this church here? To bring the gospel to both the needs of believers and unbelievers, for it is robust enough to provide rest for both types of sinners. On Sundays and in between. In fact I’ve tried to define it before. And I did a fine job, but then again, since I’m the one defining it, what’s that worth but the paper it’s written on? And I wrote it Microsoft Word. So not too much to you. Still, here’s what I mean, at least in part, when I say that I desire for myself, my family, and local congregation to live missionally: Outward facing mindset where one is willing to sacrifice self, self-comforts, preferences, and conveniences, without sacrificing the truth, for the sake of those yet to believe. This isn’t exhaustive by any means, but I think living missionally should not include less than this. I personally like definitions. I love well crafted sentences, and nifty looking models; I have a particular fondness for Triangles (thanks to John Frame). But sentences describing what ministry should look like don’t do too much for me-or for anyone-when they stay just sentences and models. Examples and illustrations are much more powerful, shaping, and practical. That’s why I try to use them often in sermons, for they flesh out definitions and propositional truth. If you want to know what I think it looks like to live missionally, we need to look no further than the example of several chaplains back in WWII. Do yourself a favor and check out the whole article here. With the Dorchester rapidly taking on water, there were not enough life jackets readily available for every man on the ship. So, when the life jackets ran out, the four chaplains removed their own, and handed them to soldiers who didn’t have them.…..
Those four chaplains, men of different faiths but believing in the same God, their arms linked, standing on the deck together in prayer. They had willingly given up their futures, their lives, to try to help the men who had been placed by the Army in their care. The U.S. Army War College has in its records a narrative of what happened that night. 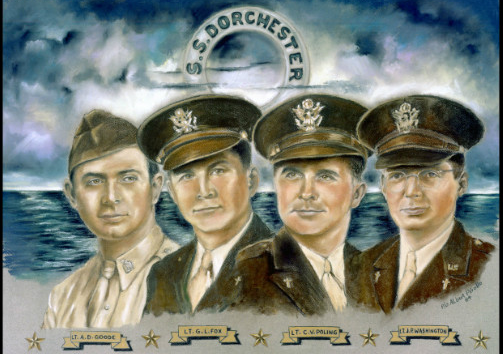 One of the men who survived the sinking of the Dorchester, a Navy officer named John J. Mahoney, is quoted as recalling that before heading for the lifeboats, he hurried in the direction of his quarters. Rabbi Goode, seeing him, asked where he was going. Mahoney said he had forgotten his gloves, and wanted to retrieve them before being dropped into the cold sea. Rabbi Goode said that Mahoney should not waste fleeting time, and offered Mahoney his own gloves.When Mahoney said he couldn’t deprive Rabbi Goode of his gloves, the rabbi said it was all right, he had two pairs. Only later, according to military historians, did Mahoney realize that of course, Rabbi Goode was not carrying an extra pair of gloves. He had already decided that he was going down with the ship. Three out of four chaplains were professing Christians and one was Jewish, but isn’t this practically what it looks like to live missionally? Those chaplains were confident of their own eternal destiny and because of that, they were freed to lovingly sacrifice their comfort, preferences, even their lives for those yet to believe. I am not qualified to speak of the theology of the three, and I’m not sure that the writer of this article is. But assuming one bases his/her entire salvation upon the finished work of Jesus, and therefore doesn’t sacrifice the truth, isn’t this the epitome of missional living? Or rather missional dying? I imagine the four recipients of those precious life vests would be quick to live more missionally after being rescued. How much more so should the Christian, who is the unworthy recipient of an even more meaningful death-for-life trade? In the blogosphere there will always be new methods and new words to describe ways in which the church can do things better. Some are quite helpful and biblical and some may not be as biblical or helpful. However within the blogosphere, many folks attack such terms or “buzz words” without truly considering the reason for why such “buzz words” sprang into existence. While I don’t think people should necessarily hop on such buzz words or new ways of doing church or missions without critically thinking through the issues like they did for that KONY video, we really need to not blast things simply because they have become popular. 1.) Terms, buzz words, and new ministry opportunities often develop because of a need. “Community” or “doing life together” are considered “buzz words.” But consider their importance. We will always tend toward individualism, and need to always be reminded to seek community and to share our lives with one another. The “one another” passages fill the pages of scripture and its commands. Whether you call it “doing life together” or “community” or some other word, you need to do life together. Buzz words can serve as helpful reminders of our need. 2.) Think critically about the goal of the term more so than the word. Some folks like to throw out the word “missional.” But consider what many people really mean by this term. Thinking outwardly on behalf of non-Christians to the point where you sacrifice your personal preference to help reach lost people. I don’t see how that’s too bad. Sacrificing biblical principles is one thing, but preferences is an entirely different thing. Most people hold on to preferences or traditions a bit too tightly. 3.) Think critically about the implications as well. If the only driving force behind your church is to be “missional” then you can lose other components. Some “missional” churches may cancel their worship service to serve their communities. Missional is a biblical component, but so is “worshipful” too. You can’t sacrifice one at the altar of the other, and this can happen if we never think out the implications. 4.) Balance the buzz words with other components of Christian life and ministry. Doing life together doesn’t mean that you neglect personally cultivating a healthy devotional life. Missional means I love, live among, and invite folks to worship. In worship I seek to explain terms, regardless if some folks feel “I already know that.” But the goal of mission is worship. So missional folks should move non-believers to worship, not entertainment. As long as one buzz word does not dominate and trump everything else, the buzz word can be quite helpful. 5.) Buzz words can actually help keep lives and ministry in balance. I find most people naturally turn inward as opposed to real, not shallow, community. And when most people enjoy community, there is still a tendency to guard that community, keeping closed and inward focused. A challenge to live “missionally” as a group reorients your thoughts to those outside your small group, and in turn keeps you from becoming clique-ish, myopic, or selfish. A kingdom focus (another buzzword) can help you remember that what you do in your work and community does indeed matter. But we also need reminders that serving our community cannot replace the proclamation of the gospel. That’s becoming almost a buzz word now. And I’m glad. We need that too. In the end, we need to learn from folks who are “gospel driven,” “missional,” “covenantal” “kingdom oriented.” Churches sometimes, and individuals most of the time, need to have regularly their pendulums swung this way.